Face Art Glitter Temporary Tattoos Instant Makeup-SPIDER WEB BLACK WIDOW WOMAN DEVIL EYES-Colorful Stick on Eye Wear Fake Tattoo Decals. Eye Shadow Sequin Decor Sticker Transfers. Special Effects Cosmetic Accessory, as pictured. Easy application and removal. Peel-and-Place, No water needed. 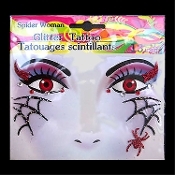 SPIDER WEB BLACK WIDOW WOMAN DEVIL EYES-Stick on Eye Wear Glitter Sequin Tattoo Decals with Spider and SpiderWeb. Eye Shadow Face Art Sticker. Temporary Tattoos Transfers with Faux Rhinestone Gems Makeup Special Effects Cosmetic Accessory, as pictured. Easy application and removal. Peel-and-Place, no water needed! 3.To remove tattoo, wipe gently with soap and water, or use a soft cloth dipped in rubbing alcohol or baby oil.